A & S Homecare – A Home Away From Home. 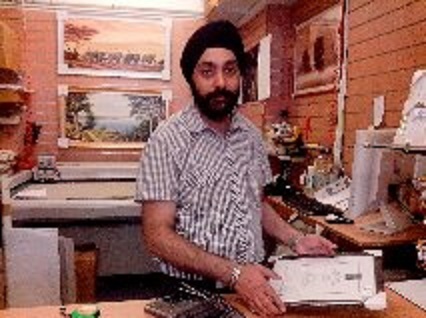 Today I went down to A & S Homecare where I met and spoke to Raj Singh about his business. As someone who grew up in West Norwood I was familiar with A & S Homecare, but having only moved back to the area recently, I wanted to know a bit more about Raj and his business. The shop itself, as a business has been on Norwood Road for over 30 years, and is ingrained in West Norwood’s history, Raj told me; being one of the oldest independent retail units in West Norwood. Raj took over the business seven years ago as A & S Homecare, and remembers at that time West Norwood being a buzzing area for business, notably Raj said he knew the goodwill that the business had already enjoyed in the area. Hailing from Southall Raj spoke about the sense of community in West Norwood. Prior to taking over as the Manager of A & S Homecare, Raj was employed at Slough borough council, after that he worked in the retail sector as a business and Retail Manager. Raj took over running A & S Homecare seven years ago and is now a company Director. A & S Homecare are an independent retail unit selling homeware, ranging from cookware, liquor ware, curtains, linins, plastics and framing. The shop itself sells a variety of goods, but offers a made to measure service for curtains and blinds with a free measuring service, and a full curtain and blind fitting service, including tracks and poles. Bespoke framing and mount cutting are offered at A & S Homecare for everything from your school photographs, to your most treasured art work. Raj was keen to let people in West Norwood know there isn’t a need to go to Town or Brixton for your curtain, blinds or framing needs. Raj spoke about Norwood Road as a High Street in recent years, having seen shop closures, mentioning there still being a few empty units, he said he would like to see more diversity in business on the high street, and called West Norwood Feast a shot in the arm that was needed. Raj welcomed the opening of the African Choice Market and said he would love to see more diversity of business in West Norwood, including more restaurants open in the evenings. I left Raj framing, and took a picture of him while he framed those of others. A & S Homecare is located on 288 Norwood Rd, Norwood, London SE27 9AF, and opens 9 – 6pm Monday to Saturday and 10 – 4pm on Sundays.